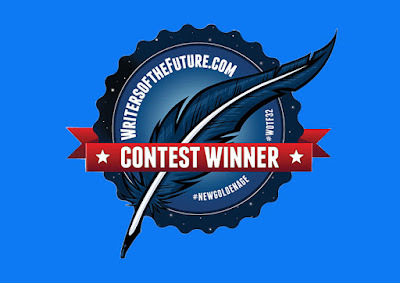 Yesterday, the official 1st Quarter results for Writers of the Future were announced. If I'm in your twittersphere or book of faces, you may have heard the good news already: my name somehow crawled its way to the top of the list. I won 1st place! In my last entry, I wrote about the mysterious call that bore the news of my finalist status, and how I almost didn't answer the phone. This time I was ready for it. When I saw "NO CALLER ID" on the display, I braced for impact--not for good news, but for bad. I prepared myself for disappointment. I haven't posted in the Insecure Writer's Support Group in a long time, but there's still an insecure devil on my shoulder. Whenever I'm expecting news on a submission, he jabs me in the cheek with his pitchfork. So as I answered the call, I thought: Well, here's the bad news. But hey, you still made finalist! When Joni said, "first place," I almost dropped the phone. Next year, I'll be whisked away to L.A. for an intensive, five-day master-class workshop taught by some of the big pros of our field. Then I'll squeeze into a tux for the big awards gala, where I'll be up for the Golden Pen Award along with this year's other 1st place winners. Which means I have to stifle the insecure devil on my shoulder long enough to write two acceptance speeches, just in case. Yikes! This has all felt a little surreal so far. I've known about the win for almost a month now, and it still hasn't quite sunk in. I'm sure that will change as the year dwindles and we get closer to the big trip. In the meantime, I'd like to congratulate Rachael K. Jones and Sylvia Anna Hiven, who nabbed 2nd and 3rd place respectively. Congratulations also to the finalists and honorable mentions. 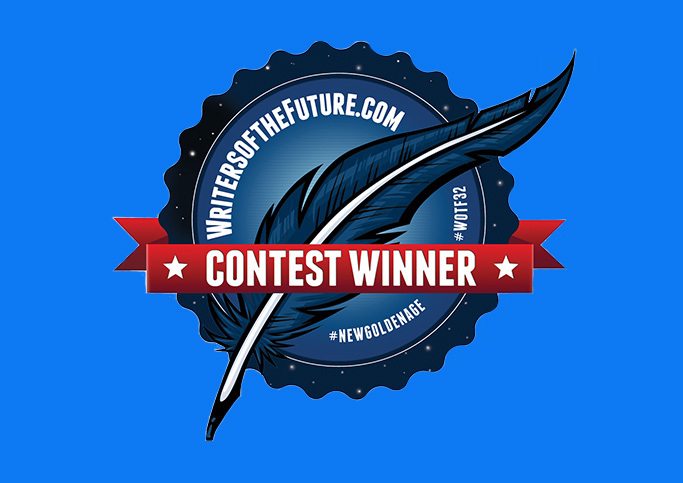 My winning story will be published in Volume 32 of the Writers of the Future anthology (which should come sometime next June) alongside the other winners. I wish I could talk more about the story itself, because it's one of my personal favorites, so I'm delighted to see it do so well. But the Golden Pen is blind judged, so story details must stay under wraps for now. Now it's time to go crouch in a corner somewhere and rock slowly back and forth until next April. Thanks to everyone who wished me luck! Those crossed fingers paid off. Wow! Congratulations!! Plus an awards gala! PLUS an awesome workshop! Major kudos! That is so great! Which story was it? Unfortunately, I can't reveal the title publicly yet. First place stories go through another round of blind judging for the yearly Golden Pen Award, so details have to stay under wraps until the big ceremony next year. When the time comes, all will be revealed!